This past weekend, I had the opportunity to attend my first crafting weekend retreat with One Crazy Stamper and Scrapbook Niagara! 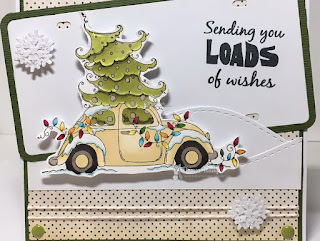 I had no idea what to take but I knew I had to take this super cute image from Stampingbella called "Christmas Bug". I had coloured it on Thanksgiving weekend back in October, and hadn't had a chance to get the card made. 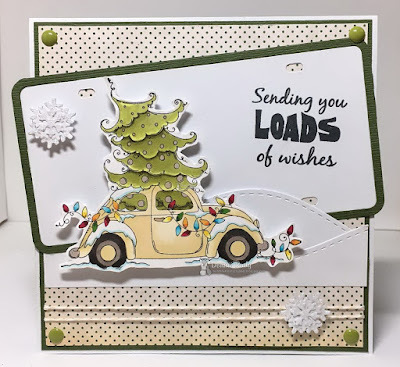 My son's girlfriend has a tan coloured VW Bug......so when I saw this stamp, I knew it was perfect for her Christmas card! After colouring my stamp with alcohol markers, I hand fussy cut it leaving a thin white edge. I added some silver sparkle pen to the ornaments on the tree and the car bumpers. I really wanted to use the licence plate die I had taken with me and used it as a place to add my sentiment. Some snowflake dies, Nuvo glitter drops, twine and enamel dots finish off my card. I hope you have enjoyed my Christmas Bug! Thanks for stopping by - have a fantastic day! This is such a Nice card Donna! Vw beetles are fun cars and she is going to love this card!! Wow another really cool card! Love that license plate die cut behind your perfectly coloured image! Alie is right she will love it! LOVE all the dimension in your card, super pretty!